Why do long weekends end so soon? I feel like I'm the hand trying to hold so much sand but it slips away faster anyway. I'm still reading Colum McCann's Transatlantic. I think I'm about 25% in, but it's not the paciest book there is, so I'm expecting that I may be reading this one for one more week at least. This weekend, I started reading Attachments by Rainbow Rowell. This book wasn't really on my radar but it was the perfect book to read in a car when there are people talking most of the time and a dog jumping on your lap all the time. I thought I may not like this one, but it's actually quite enjoyable so I'm looking forward to some good reading. I finally finished listening to Michael Pollan's In Defense of Food, which was an educational read but considering that it was published in 2008, not really containing as much new information as I had hoped to get. 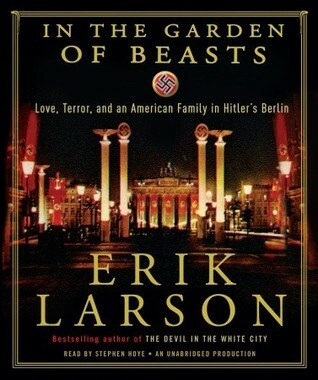 This week, I'm planning to start listening to Erik Larson's In the Garden of Beasts. Larson has been on my wishlist for a good long time and I'm finally getting around to reading (or rather, listening to) one of his books. I had been looking for an audiobook of his The Devil in the White City, but got only this one instead. Attachments has gotten some pretty good reviews. I loved Larson's Devil in the White City. There was a great documentary on it too which covers the actual events from that time. I've been wanting to get to Attachments ever since I read Eleanor & Park. I hope you continue to enjoy it. I love In The Garden of Beasts, I can't wait to hear what you think! It made me want to read Devil in the White City ASAP. I loved Eleanor and Park so I really want to read Attachments now. I'll be watching for your review. Thanks! It is fun so far! Attachments is entertaining so far. I'm hoping to read the author's latest, Eleanor and Park soon after this. That looks pretty good too. I didn't think of reading Attachments until I started reading all these reviews about Eleanor and Park. After this, I can't wait to read Eleanor and Park. I will be starting In the Garden of Beasts tomorrow. I hope to get an audiobook of Devil in the White City soon after. I've been intrigued by all these reviews of Eleanor and Park, so I figured I might as well read Attachments first. Are you reading it too now? It is pretty entertaining. I did! :) I can't wait to read Eleanor and Park after this. I enjoyed Attachments quite a bit and was also surprised. Enjoy! I am. It's fantastic I think. I love the fun banter. Rainbow Rowell's Eleanor and Park is a pretty good read so since you're enjoying Attachments, I suggest you add E & P to your tbr list. Today I'm finishing up Lynda Barry's What it Is. Have a good week! The Devil in the White City is probably my favorite non-fiction book ever. I haven't heard the audiobook, but I bet it would be great. I have a copy of In the Garden of Beasts, but haven't gotten to it yet. Looking forward to hearing what you think! My boss gave me In the Garden of Beasts to read...I need to get to it.